For more info on the GizmoHub 3.0 app, refer to GizmoHub FAQs. Gizmo devices can only be deleted via the GizmoHub app on the Primary Guardian (Guardian 1) smartphone. Enter your new mobile number then tap Save Changes. You are not required to change your password; press the Back arrow on device to remove keyboard. Tap the Checkmark icon on the GizmoWatch to verify the GizmoHub app is downloaded. Tap Add Gizmo then tap Get Started. Tap OK to confirm security code with new device, the 'Pairing GizmoWatch' screen appears. 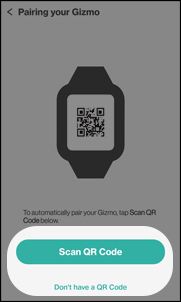 Tap the Checkmark icon on the GizmoWatch to finish the pairing process. From the 'Success' screen, tap Continue. 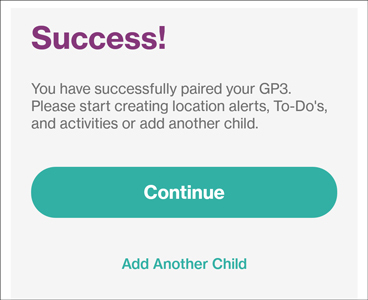 Continue to set up your child's profile and contact list. Secondary caregivers receive a new invitation to accept. Secondary caregivers may have to sign out and back in for full functionality.